Mix engineer Tommaso Colliva on recording Drones : "Matt always tracks the vocals by himself. I set things up for him, and the mic pre we use is always a Neve 1073, usually with an 1176 compressor. I dial in some settings and he may nudge things up or down, depending on the kind of vocals he’s tracking. We also very occasionally used a Mercury M76 tube mic pre, and on a few songs Matt wanted to hold the mic in his hand, but we didn’t like the sound of a dynamic mic too much, so we ended up using a FET47 which I took out of the mic mount and wrapped in foam. " Used to record the album 'Lazaretto' : "[Acoustic guitars] would go into the 1073, usually with a bit of 1176 compression." Engineer Derek Ali on recording To Pimp a Buterfly : "I mostly use our Stephen Paul-modified Telefunken U47 to record Kendrick, going through a Neve 1073 mic pre and then a Tube-Tech CL1B compressor, which gives a great, fat, warm vocal sound, especially in conjunction with the U47." Neve 1073 mic pres were used for recording electric guitars, acoustic, steel guitar, and vocalists Todd Edwards and Paul Williamson. In this Sound On Sound interview, on the "Jumble Sale Studio" section, a bunch of Jenkinson's gear is mentioned. Among them, the Neve 1073 Mic Preamp. "It's a ragtag collection of stuff, and there's no discernible overall 'vintage' rationale behind the collection as a whole. The most significant pieces are a Roland TR909, TB303, SH101, V-Synth XT and V-Bass 99, Neve 1073 mic pre, AKG BX15 spring reverb, TC Electronics D2 delay, DBX 1066, a self?made mechanical reverb, Tom Jenkinson's custom?made spring reverb." However, it is not specified that the item that Tom uses is actually the Neve 1073 DPD, which can be spotted in the interview's [second picture](http://dt7v1i9vyp3mf.cloudfront.net/styles/news_large/s3/imagelibrary/S/Sq_02.jpg?kC1jQiJeWcYtwEFcNLZvzPeUT28NpbaD=&itok=gvlIo_y0), right under the fan. "When I’m recording, I go between an API and the Neve A1073 mic pre…" says Gilby Clarke, in [this article](http://www.vintageguitar.com/2903/gilby-clark/). 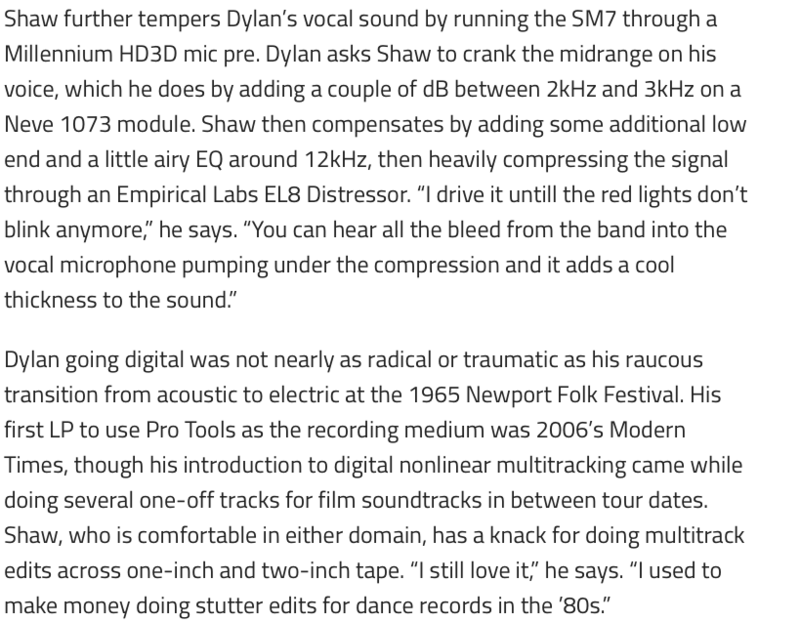 Bob Dylan's vocals ran through a Neve 1073, according to [this article](http://www.emusician.com/artists/1333/recording-bob-dylan/40613). Neve never fails their reputation, and these two sets of pre-amps – AMS 1073 and DPA 1073 – are the living proof of that. They’re some of the only pre-amps out there that can colour different sounds and frequencies and still make them all sound excellent. Many times some pre-amps do justice with the high end while not with the bottom, or vice versa, but these babies are always on point. > On the previous record, we used a Neumann M 49. On this one, we used a Sanken CU44X into a Tube-Tech MP 1A mic pre, then into the line-in of a Neve 1073 mic pre, for a little EQ tweak. Out of there, it went into an 1176 and a Massenberg EQ. From there into a dB [now Lavery Engineering] converter ahead of the R1. Right, well for recording we put the bass through two Neeve 1073 mic preamps and had various sounds going through them. We mic’d the amp as well. This item can be seen 17:26 into this video at the Future Music youtube channel in celldweller's studio tour video. This article states that Jerry's studio includes "Daking (2), Focusrite (6), Grace (8), Neve 1073 (8), Neve 1084 (8), Telefunken V76 (4), and Upstate Audio (4)." Neve 1073 preamp is included in the list of Mark's "Studio Gear." The 1073 can be seen in his rack at about 0:40. "so i'll have the stack - sometimes also with a moog in there somewhere - running into an ashly line mixer, stereo out through a 1073 preamp into a burl b2 ad converter. lots of transformers." "The real deal #1073 #neve"
I'll take anything from Neve, honestly. But I've been looking at new mic preamps anyway. Crunchy, British, and very clean gain comes only from the never-failing Neve 1073 LB pre-amplifier. I use it stored in my Radial Workhorse and I love it to bits.